Chaos gets a new Grade 2. AUTO (RC) [Soul Blast 1, and retire this unit] At the end of your turn, you may pay the cost. If you do, your opponent chooses one of his or her rear-guards, and locks it. 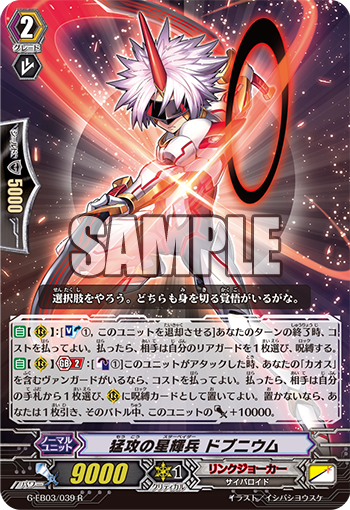 AUTO (RC) Generation Break 2 [Counter Blast 1] When this unit attacks, if you have a vanguard with “Chaos” in its name, you may pay the cost. If you do, your opponent chooses one card from his or her hand, and may put it on (RC) as a locked card. If your opponent does not, draw a card, and this unit gets Power+10000 until the end of the turn.